For every action, there is a reaction. When Hyundai first introduced themselves into the US market in 1986, they were an immediate hit that only lasted as long as a teen’s awkward first date. Initially, Hyundai Motor America set the record for selling the most automobiles during its first year of business in the United States when compared to any other car brand, selling a grand total of 168,882 cars. Its first model, the Hyundai Excel, was even nominated by Fortune Magazine as “Best Product #10″ back in the day and was praised for its affordability. And as terrible of a blow that might have been, it forced Hyundai back to work as the brand retreated to the drawing board to fulfill the inherent mission of rebounding from failure for the sake of success–and what a rebound it was. Almost 30 years later, Hyundai has evolved faster than anyone predicted, becoming one of the most reliable and dependable automakers the world has ever seen with quality that rivals and even surpasses that from Toyota Motor Corp and Honda Motor Corp.
Not to mention, Hyundai was ranked repeatedly as one of the World’s Most Admired Companies from CNN.And the fact that everything they’ve produced in the meantime has improved nearly two-fold at the turn of every generation speaks for itself in volume. A Hyundai of some sort can be spotted as frequently as many of its direct competitors. 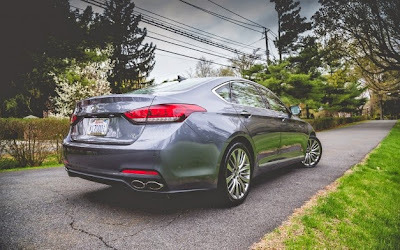 Fast forward to current day and there’s no better way to exemplify this upward trend with the all-new and completely redesigned 2015 Hyundai Genesis sedan. Birthed in 2008, it didn’t really set out shocking the world as it was intended. But it initiated Hyundai’s new exploration into an entirely new brand identity, exuding thorough proof that the South Korean automaker could succeed at producing a car worthy of battling out in an otherwise European and Japanese dominated luxury arena. It might not have been an immediate victor by any stretch of means, though quite simply, it worked and Hyundai’s are nicer and better than ever before and the brand is more powerful than its original founders ever intended. So now that the second generation Genesis is here, has the automaker nudged ever so closer to competing with the industry’s luxury leaders from Germany and Japan? Quite simply, yes, yes they have. The first Genesis was as humble and honorable as any Asian nation of pride with a rather mundane and bland exterior that was otherwise somewhat unique in its own ways. If you didn’t know a thing about cars, you could probably have mistaken it for a Lexus. The story is kind of the same with the 2015 Genesis, though in a much more modern package that is actually far more eye-catching than the first generation. 2015 Hyundai Genesis (2)The new Genesis sedan was first previed by the 2013 HCD-14 Genesis Concept from the 2013 North American International Auto Show and that’s quite obvious. Reminiscent of Hyundai’s latest Fluidic Sculpture 2.0 design philosophy, this includes Hyundai’s latest overturned trapezoidal corporate grille that almost follows the way of Audi. The roofline is much more raked to the rear in a four-door coupe like form and the profile is long, slim, and slightly muscular with its protruding and angular shoulder-line that runs the side-length of the car. It indubitably screams luxury sedan much more than the outgoing version. 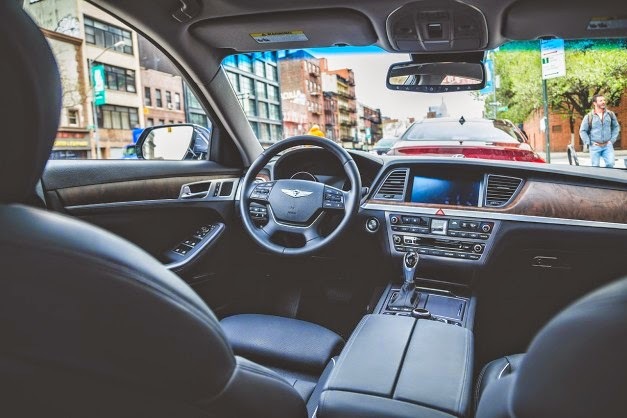 If you sat blindfolded inside the 2015 Genesis, you would also feel like you were sitting in the plush inner confines of something from Germany or Japan’s luxury divisions. The build quality of the latest and greatest Genesis sedan is simply impeccable for the vehicle’s intended market. Hyundai’s upward trend in build quality is superbly apparent in the latest model and there was nary a material to complain about. In this specific top of the line 5.0 model, occupants are surrounded by soft-touch vinyls and soft leathers as well as plenty of matte-finished wood trim. The seats are adjustable in more ways than there are forward gears and the lay out is clean, elegant, and very upscale. 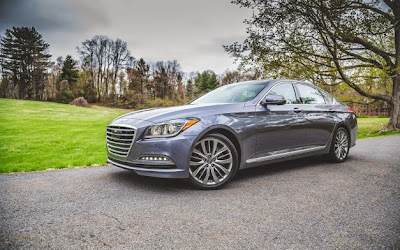 If there was one easy way to describe the 2015 Genesis, it felt like the Equus’s little brother. Speaking of the Equus, which we tested last year and loved, the new Genesis 5.0 uses the same carryover 5.0L Tau V8 from the last generation’s Spec-R model and as the aforementioned Equus. That luscious V8, which sounds like BMW’s last naturally-aspirated eight cylinder, still sends 420hp and 383 lb-ft of twist to the rear wheels–slightly different figures from the Equus’s 429hp and 376 lb-ft of torque. The standard engine, also a carryover, is the typical 3.8L Lambda V6 that we’ve come to be very familiar with, good for 311hp and 293 lb-ft of torque, which is no slouch either. Between the axle and the mill sits the brand’s in-house eight-speed automatic for both models. Should you want better traction, all-wheel drive is available only for the 3.8L model. So from the looks of it, the 5.0L is for the driver–hence our decision to choose the 5.0L for quick testing. During our one hour dash through the lower Hudson Valley and in and about Westchester County, the 2015 Hyundai Genesis drove every bit like a seasoned premium midsize sedan with dollops of sportiness should. Helping keep things civil for the two-plus ton midsizer was Hyundai’s optional Continuous Damping Control adaptive suspension, only available on the 5.0 model. The setup is otherwise what it should properly be: no MacPherson struts up front, but multi-link setups all around, which by inherent nature allows some of the most precise suspension tuning known to man. These are tip-top details, people, and in the case of the automobile, they all add up. Lest we forget, the suspension also received a helping of tuning and tweaking from the boffins at Lotus and it very clearly shows. Steering is still light on feel but its accurate and well-weighted as anything in its class and that said weight is equally progressive in the corners. Well played Hyundai, well played. So, because the 2015 Hyundai Genesis achieves the goal of a midsize luxury sedan it also happens to be the best damn Hyundai yet. That said, the price did climb a bit with the V8 model starting at $51,500, which is about $4,100 more than the outgoing 5.0L R-Spec while the base V6 2015 Genesis begins at $38,000 with the all-wheel drive variant at $40,500. The base model gets a hike of only $2,800. Having sampled the fully optioned 5.0L Ultimate model, the Genesis serves its purpose better than even some of the Germans–and even Lexus–by being a direct competitor to them all by virtue of value. Hyundai admitted that their sites were set directly on the Mercedes-Benz E-Class, the BMW 5-Series, the Lexus GS, and the Audi A6–and the Genesis is as much of a bonafide luxury sled as them all at a much cheaper price. Just as an example, a base a la carte 2015 Mercedes-Benz E550 requires over seven grand more simoleans.Hop down to the Genesis V6 model and it sees the Ford Taurus, Chevrolet Impala, and Chrysler 300 as the next competitor set–and by far the Genesis blows them all out of the water. Needless to say, that provides the Genesis a very broad market reach and we can already hear both sides comin’ a knockin’ for the order books.